So you went to Rosh Hashana services (or not), and you plan to go to Yom Kippur services (or not). Maybe you say a few prayers, listen intently to the rabbi’s sermon, allow the cantor’s music to suffuse your soul. Have you fulfilled your High Holy Day responsibilities? Can you check off this week’s To Do list – “Get into the metaphoric Book of Life”? Sorry, that’s not really how it works. The High Holy Days are about doing the work, spiritual work. Called Teshuva or repentance, this High Holy Day work requires that we prepare before, work during, and follow up after these awesome Jewish days. 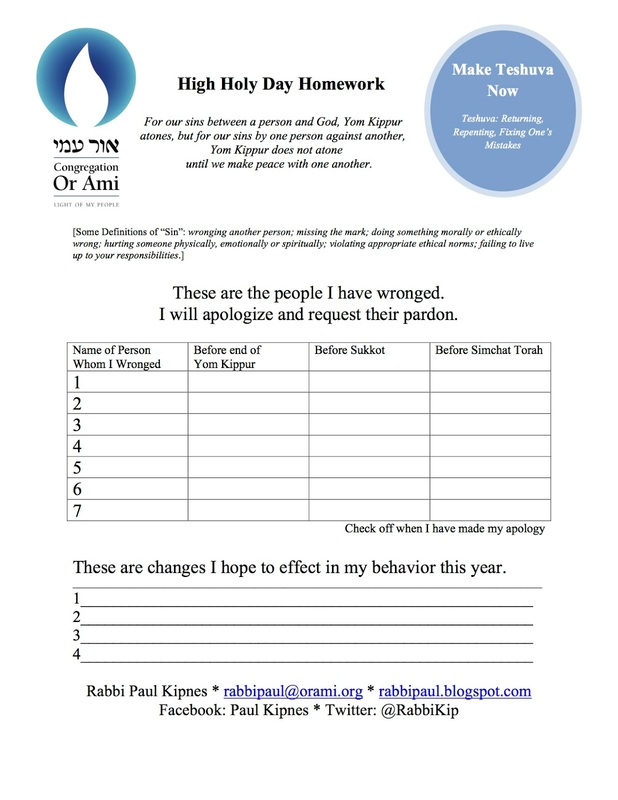 To make it easier, I have for you a High Holy Day Homework sheet. It is self-explanatory. It is surprisingly simple to fill out. Once you complete the form, you just need to follow up – by seeking out those you have wronged, and starting the process of repair. Sure, the process can be much more complicated, but you might use this worksheet to get you going. Luckily it is self-graded by you (well, many believe God will be the ultimate judge too, but that depends on your theology).